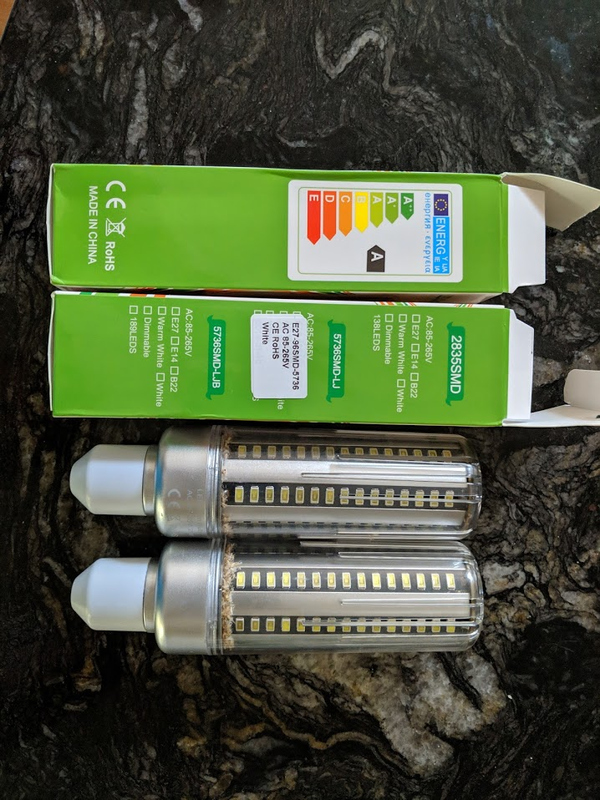 So last year I installed a whole lot of LED bulbs. Power dropped off, great. One area that got new bulbs was the porchlight. This was 2 sconces, outdoors but covered (both covered by the overhang and covered by the sconce). So not a 'wet' environment per se. Into this were installed a pair of 'corn-cob' lights. Fast forward a year and they have both failed. So, lets have a quick look. First, we discover that the 'open' nature of these bulbs (let the heat out) allows a variety of small inects in. Nice. Crusty. Um, yes that is the high-voltage power supply just flapping around. The tape is just to lightly insulate it from the metalised plastic sides. No structural support. Great. It was more or less supported by those two wires that were tacked to the bottom to a could of pads. Hmm. Now, i'm not sure what output voltage that supply is meant to give (e.g. 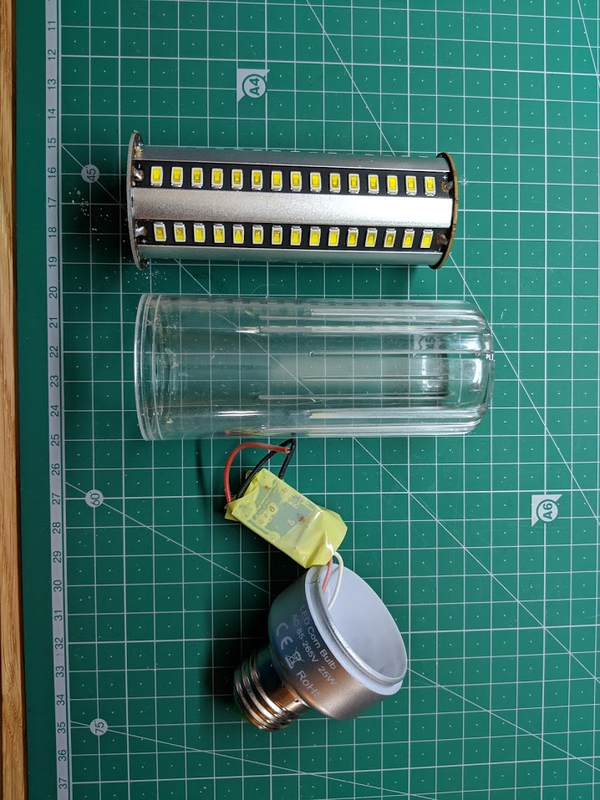 the parallel/series arrangement of the LED's). My bench supply only goes to 30V and that was not enough to light (so either we have burnt-out LED in series, or >30V). If we count the LED, we se there are 15 per row, my guess would be all in series. Let's have a closer look at this supply. 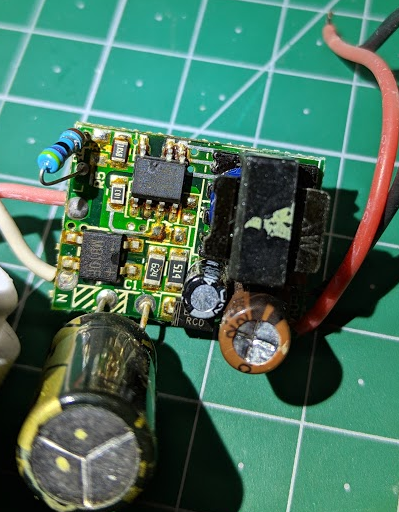 Its not a capacitive dropped, and it is isolated galvanically by the transformer (but not really by the tape, and there are no cutouts on the PCB). The soldering looks kinda crusty, so the board was not likely cleaned. Of course, it has been somewhat out side, so that could be garden variety rust too... No conformal coat here. 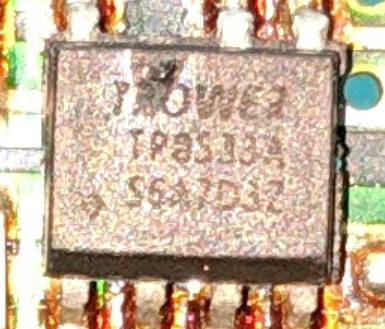 the writing on the IC is a bit hard to make out, 'TROWER'(?) TP8533A maybe? its below if you want to have a shot at CSI-enhance. (update: datasheet attached). the meter suggests maybe this is 5S3P arrangement, so ~10-12V output? O well, bought another two. These are not that cheap (in $). Hmm. I’ve fixed a number of dead LED back-lit TV’s found on Kijiji and through friends. 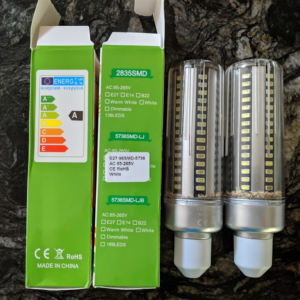 I guess it’s so much cheaper to put all the LEDs in series and the economies of scale has managed to bless us with LEDs that actually fail open and dangerous driver circuits. 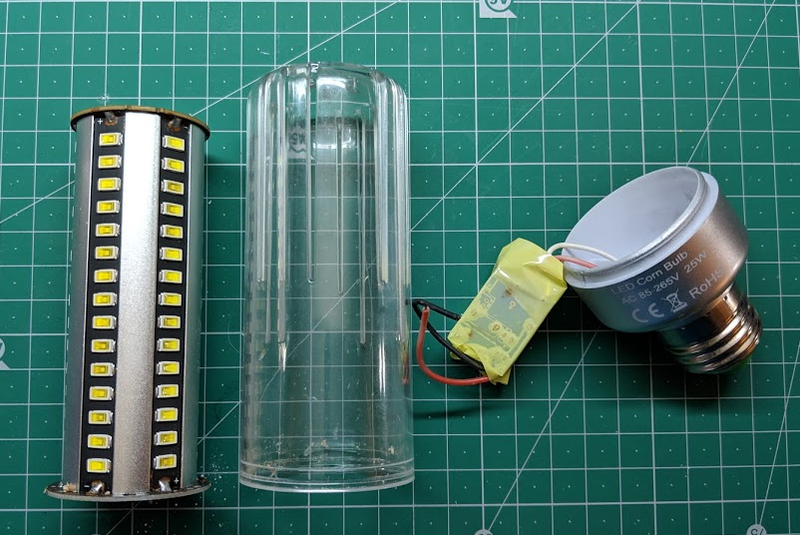 Some LEDs require 5v each and some of these current limited back-light circuits operate over 300V and have a maximum current rating approaching 70W, without a fuse. I had a 75″ big popular brand that internally caught fire after the warranty, I was pretty tempted to see if I could get some consumer safety regulator involved but I got the manufacturer to buy it back. I assume at 300V things can start arcing and at 70W we are approaching easy-bake oven territory. Also it seems the pulse width modulation for dimming sometimes happens on the negative side and the conformal coating on the PCB may be the only thing between 300v and ground near the metal tabs that hold the LED strips in the light box. Anyway, China also makes these cheap fancy smart LED driver tools that help make the series LED troubleshooting easier… It’s basically a compact current limited 300v supply. 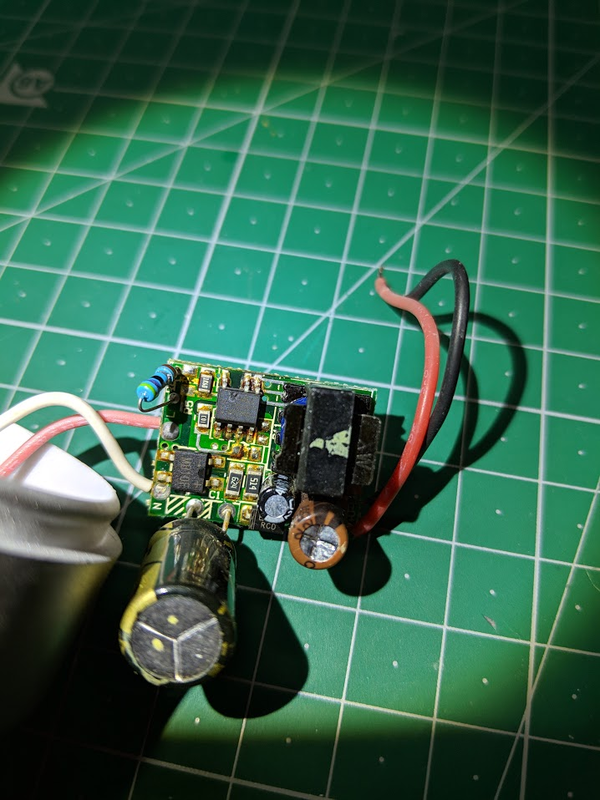 You can usually use a good hot air station to replace the $0.10 LED to fix the ol’ strand of Christmas light. They can burn your house down another day. free to good home. two $25 LED corn cob lights. Lightly used. Some bugs. May have missing led(s). Know a guy named jayme who will fix w/ warranty.